Ever heard about future technologies? Everyone knows Robot and also knows that they will be made into the future soon. When we talk about robots, they come up with technology right? They are the machine after all. All machines work on technology, a piece of scientific knowledge. 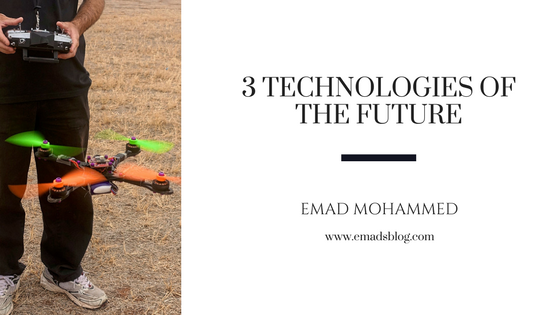 In this article, we are going to know about 3 Technologies of the future. Don’t worry about those robots I discussed. The technology they used to learn what they are made to is discussed in the technologies of the future I am going to tell you. Let’s get started with those 3 technologies from the future. Maybe you know this word. It even seems normal and you don’t have to take a dictionary to find its meaning. It is also referred to (Machine Intelligence). It is an intelligence shown by machine. I talked about robots right. This is how you teach the robot, the work they have to do or the way they mean to react to something you say or did. This not only applies to Robots but to every machine out there. Let’s take an example of Alexa, Siri, Google Assistant, & Cortana. How they react to what you say or told them to do? They are not fed with data to say every time you say anything. They work on the basis of AI. They know what you’re saying and respond accordingly and differently every time you ask. Now, you have questions like “Why AI is from the future as it exists now?“. Yes, AI exists but it is still in beta. It will be more powerful than it is right now in the future. There will be no limit to what AI can get in science. The application of AI, that is Machine Learning gets in the arena. All Machines need to be programmed to work, but this application Machine Learning gives the ability to the Machine to learn automatically from the experience or say Data without being programmed. In the 10 years to be accurate, Machine Learning gave us Self-Driving Cars, Effective Web Search & Practical Speech Recognition. In short, we are given books to learn. Just like that, they are given data to learn from automatically. Machines have been faster than Humans. It’s likely that they will learn it faster than we do. The future will tell us. It was estimated that the AI market is around $8B in 2016 and may rise to $72B by 2021. We heard about it a lot in 2017, it was all way down on Social Media platforms in the form of news, memes and what not? Its sudden rise in exchange price makes it go viral on the internet. The highest it went was around freaking $19,700 before it came back to $9,000. You kept sharing and telling others about the prices and bitcoins but some of the techs companies took it seriously. They started to work on developing StableCoins that would provide all advantages of cryptocurrency transaction but without the fluctuation of prices. In the future, it is expected that it would appear as “Mode of Payment” everywhere. This can be good for many but also worse for many of the people. It can give rise to unemployment. Automation has already taken many leading manufacturing industries in the technology sector. Automation is the process where machines are employed to do the work replacing the Humans. Heard of the company Apple? You might know of Foxconn. It is the manufacturing industry for all Apple iPhones. Recently, they planned to invest $4 Billion in automation & robots. They replaced around 60,000 Humans with Machines. This is what Automation is. In the future, it is predicted that automation will found in every field & not only in Manufacturing industries. It will replace the Cashiers, thanks to another technology out there called “Motion Sensor“. We can even see the future coming! Amazon introduced its Automated Supermarket after a year of testing. There is “No Lines, No Checkouts” that means no cashiers or counters. You need to pick the items and walk out. As simple as that. Woah, do you know how it works? Motion Sensors, Cameras & Artifical Intelligence of course. This is how they know what you picked and charge accordingly in the App made by Amazon. That’s it! Welcome to the future. Hope you liked it, you can share it with your friends & family and tell them a bit more about the future. You can also suggest me on what topic I would be writing next in the comment box below. See you all soon in the next post!